When a father and son are self-confessed petrolheads like us, what better project to spend quality time on together than building the classic Kiwi homemade go-kart. The idea was to give my son Kurt (12) an introduction to the very basics of engineering and mechanics while enjoying a bit of one-on-one time in the shed. I could see the front axle getting bent at some stage so rather than making it a permanent part of the frame as in most karts, we made this one removable. Our design also differs from conventional karts in that only the left rear wheel drives. The right rear wheel runs on bearings like the front wheels. 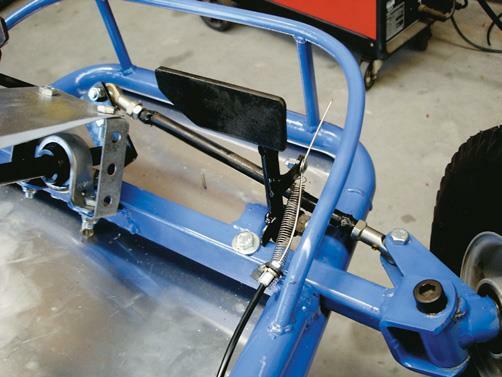 This makes the gokart much easier to turn and puts less load on the engine and clutch when cornering. It does, however, mean that the kart hangs out better in a right-hand turn. The frame is a very simple design, made mostly out of 32 mm exhaust tube. We used 40 mm x 5 mm ﬂat bar for the seat mount and rear axle bearing mounts. For the front cross member / axle mount and idler shaft bearing mounts at the back, we used 40 mm x 40 mm angle iron. The front axle and engine mounts are made out of 25 mm x 25 mm x 3 mm box section. The hoop behind the seat enables the frame to have a rigid, triangular shape both front and back; this helps to isolate the driver from the engine, chains and axle. 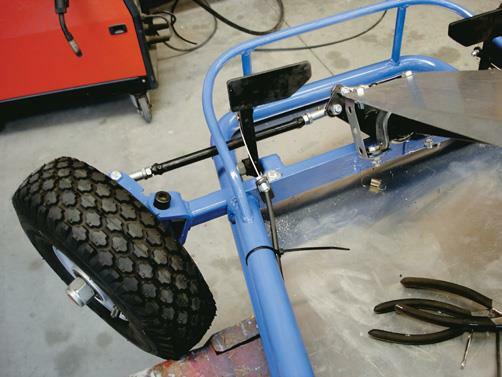 The front axle is held in by three bolts and has the pedal mounts attached to it. The stub axle is a standard item that you buy already machined to suit the rim. The axle is way too long for this application so it is cut to a length that clears the rim. The off-cut is bored and welded to the stub for the king pin to go through. “Ds” at each end of the axle are on a 66º angle and are actually standard off-the-shelf trailer leaf spring hangers. Cap screws or bolts with Nylock nuts make good king pins. The front spindles were specially machined and welded to match the 66º angle of the “Ds”. It should be noted that there is a lot of force put on the spindles when cornering and it is advisable to get these professionally welded if you have only a small single-phase arc or MIG welder. The drive gear with bearing in place. Alignment of engine, clutch and idler shaft. The steering shaft is 16 mm solid rod and has a spherical bearing at the top and bottom. This shaft needs to be well-mounted as the driver tends to use the steering wheel as the main upper body support while doing the “Greg Murphy lean” through the corners. The steering wheel is also an ideal place to mount the On/Off switch. Completed framework prepped and painted. The rims are RW100-S25 integral hub wheel assemblies and are ﬁtted with sealed high-speed bearings and 410/350 x 4 tyres. The ground contact area of these tyres is quite small and great if you are looking for minimum traction. The driving wheel has the bearings removed and steel collars with a 25 mm ID and 8 mm keyway are permanently welded in. Brakes can be ﬁtted on four wheels if you want to go to the trouble and expense. But we ﬁnd that the rear one-wheel brake system is adequate and a little more exciting if you need to stop in a hurry. The disc is off a small Chinese “pit bike” and is mounted to the same type of collar used in the centre of the driving wheel. This assembly (using the same keyway as the wheel) ﬂoats on the axle while being kept in place by the calliper. The calliper, hose and master cylinder are off a 110 cc Chinese quad and come as a ready-made assembly. The master cylinder is mounted out of the way next to the seat and your “garden variety,” pushbike inner-and-outer brake cable joins the master cylinder to the pedal. The rear axle started as a length of 30 mm shaft and was machined to suit the frame, wheels and engine we were using. You need to know exactly where the engine, sprocket, disc and bearings are going to be mounted and which wheel assemblies you will be using before the rear axle can be machined. To keep things cheap, we used FY506M two-bolt housings and 30 mm ID spherical bearings to mount the axle and half-inch industrial sprockets and chain. Our starting ratio is 2:1 from the clutch on the engine back to the idler shaft (which also uses FY506M housings and 30 mm ID bearings) and then 2:1 from the idler to the axle. Some engines come complete with the clutch and 2:1 reduction which eliminates the need for the idler shaft and you just need the 2:1 reduction from the engine to the axle. Base pan in place. Note the access holes for the seat bolts. Mounting bearings for the steering. The range of engines you could use is endless. But the horizontal-shaft, industrial single-cylinder engines are cheap, easy to mount and come complete with the exhaust and fuel tank. If you use a Honda or a Chinese Honda copy, you will need to disconnect the low oil sensor as it shuts the engine down when cornering. Free up the throttle lever by backing off the lock nut, add a return spring, run the push bike inner-and-outer cable from the throttle lever to the pedal, ﬁt a return spring to the pedal and the job’s done. The engine rating of 6.5 hp doesn’t sound like a lot, but with the right gearing it’s got enough boogie to put a smile on the face of most petrol-head dads, let alone the kids. On a ﬂat grass area or wet asphalt these things will drift like mad. They are nothing like a competition race go-kart but they are a lot of fun. And if you are like us, you will keep on spending more quality father-and-son time in the shed trying to make the thing go faster (13hp version nearly ﬁnished). Steering wheel and shaft assembly.